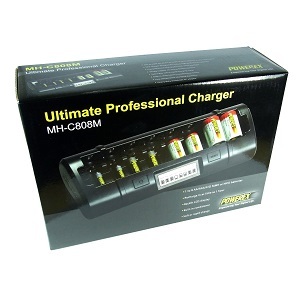 MH-C808M : Premium Professional Charger for 1 to 8 NiMH/NiCd cells - works for AAA, AA, C, & D sizes. Home > Chargers > MH-C808M : Premium Professional Charger for 1 - 8 NiMH/NiCd cells - works for AAA, AA, C, & D sizes. Has 8 independent Charging channels ! 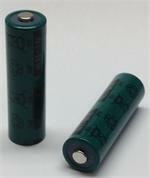 MH-C808M : Professional Rapid Charging & Conditioning system - for 1 thru 8 NiMH or NiCd battery cells. Works for AAA, AA, C, & D sizes. Charger has 8 individual smart-charge channels - each battery is charged indivudually! Different types, sizes, and capacities can be placed into any of the slots - up to 8 pcs at a time. Works for AAA, AA, C, & D sizes. 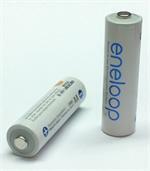 Charger has 8 individual smart-charge channels - each battery is charged individually, and each separate channel stops charging when its battery is full. 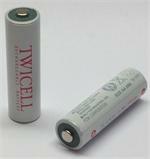 Typical charge time for AAA = 1 hr; AA = 2 hrs; C & D = 4 - 5 hrs (dependingon capacity and inherent charge). 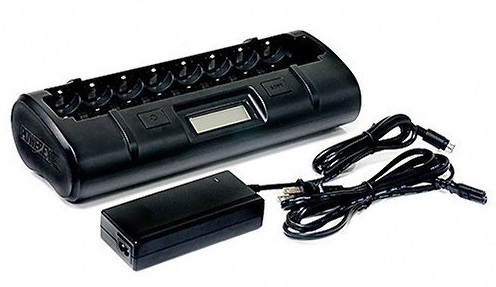 Unit plugs into wall AC power - Includes a 100-240VAC worldwide power supply. Batteries are sold separately.